Holden Corso Road — Island Red Cedar Construction Ltd. This family home is situated on a mature acreage of rural land outside Nanaimo, with a mature orchard on a south-facing slope. Their existing deck is on the south side of the house and creates a sun trap against the house. This is great on a sunny autumn day but in the middle of summer it makes for an unusable outside area of the house. The owners had put up a small sun shade but ended up jostling for space under the shade with each other and the multiple family dogs. Something had to be done! 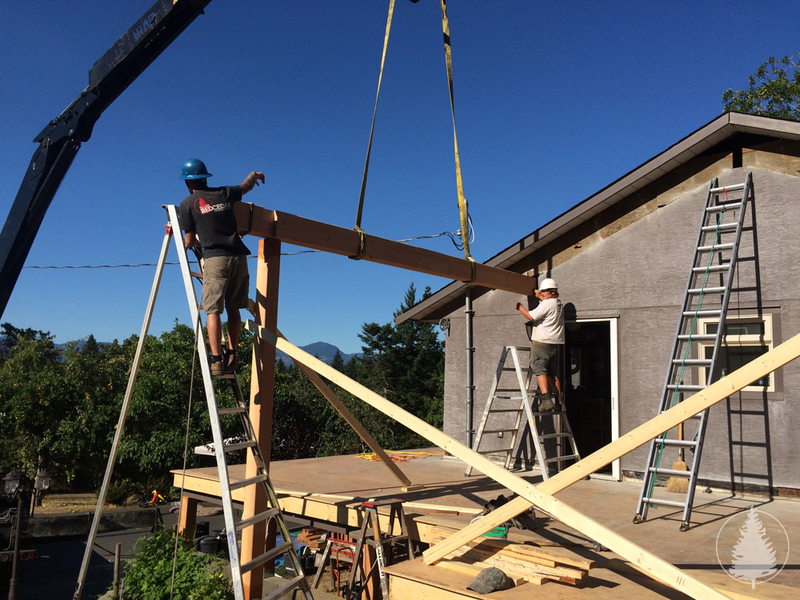 The deck space was extended all around the house to provide a new sun deck that will get better views to the west, easier traffic flows between deck spaces and a new post and beam covered deck that will allow for year round entertaining and enjoyment. Heavy Douglas fir post and beams are complemented by the black framed glass railings that still allows for unobstructed views. The roof line was matched to the existing and the cedar trim was replaced on all the roof facias to tie the new in with the old. 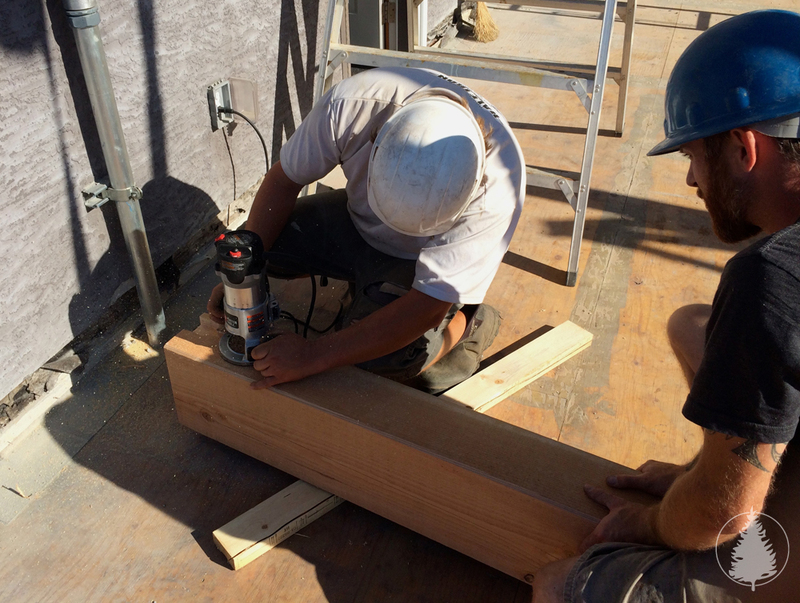 New deck support posts help to frame in the front of the house and the lower entryway. The existing rock work ties in beautifully with the mature gardens and new heavy timbers. For a family that loves the outdoors and the space they're in this addition made it all the more enjoyable. 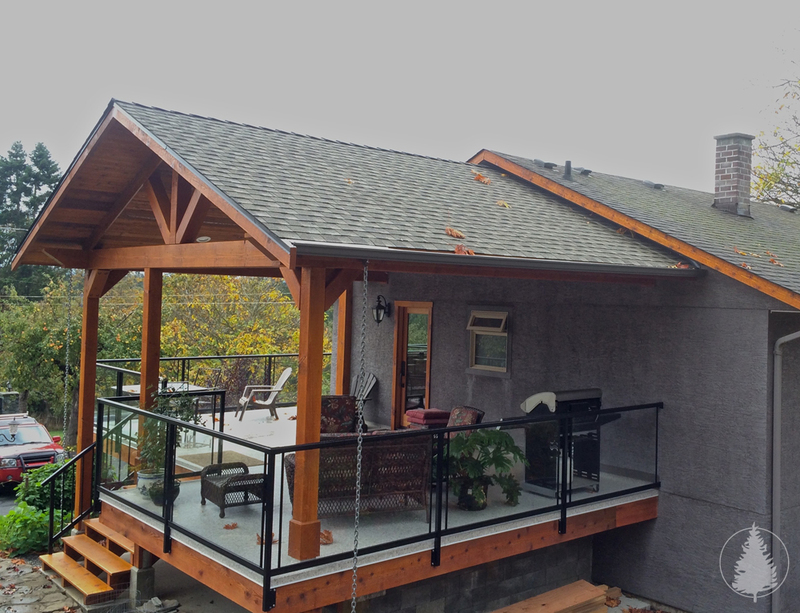 "Island Red Cedar Construction built us the most amazing deck! It is so much more than we could have imagined or hoped for. We had an idea of what we wanted but then Sean and his excellent crew took it to a whole other level, we have been feeling very blessed indeed to have found him to do the job for us. They are so professional in every aspect of their work. They all took great pride in their craft and paid close attention to details. The quality, style and perfection of their work is what gives them a resounding stamp of excellence from us."